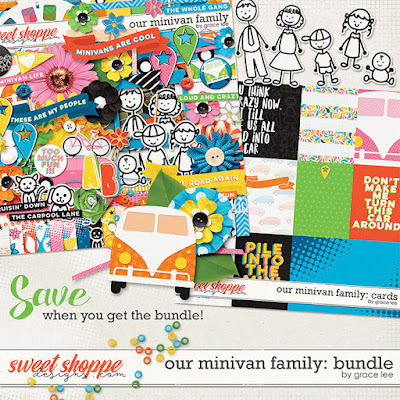 Our Minivan Family: Bundle is full of road-tripping, errand-running, and daily-driving fun! Filled with bright summer colors, it is perfect to document the day-in-and-day-out life that parents can spend in the car with their children and the fun selfies we sometimes take on the road or in the carpool line! and 73 elements. The elements included are 2 bows, 3 buttons, 4 clips, 2 flags, 3 flair, 15 flowers, 3 foliage, 3 frames, 4 markers, 2 paint, 1 postcard, 1 reel, 4 ribbons, 2 scatters, 1 stamp, 7 stick figures, 2 strings, 6 vans, and 8 word art.